Also serving communities of Redmond, La Pine. The average cost of memory care in Bend is $3,772 per month. This is lower than the national median of $4,655. To help you with your search, browse the 4 reviews below for memory care facilities in Bend. On average, consumers rate memory care in Bend 3.8 out of 5 stars. Caring.com has helped thousands of families find high-quality senior care. To speak with one of our Family Advisors about memory care options and costs in Bend, call (855) 863-8283. In Oregon, there are approximately 65,000 people over age 65 living with Alzheimer's disease or another form of dementia, and that number is only projected to grow over the next decade. In Bend, where more than 15,000 residents are 65 years of age or older, there are five memory care facilities available to help meet the needs of seniors with dementia and their families. Oregon State's Department of Human Services may license memory care facilities in Bend as nursing facilities, Assisted Living Facilities (ALFs) or Residential Care Facilities (RCFs). Oregon requires memory care facilities to obey special rules to ensure residents' safety and security. For example, memory care facilities must provide their staff with training on how to care for the unique needs of residents with dementia. According to Sperling's Best Places, Bend has a pleasant climate. It scores 69 out of 100 on Sperling's comfort index, which is above the U.S. average rating of 54 and means that seniors living in Bend can expect to enjoy a higher than average number of days each year with temperatures in the 70s. Living in Bend can really stretch a senior citizen's budget. Sperling's Best Places estimates that Bend's cost of living is more than 34 percent above the national average. 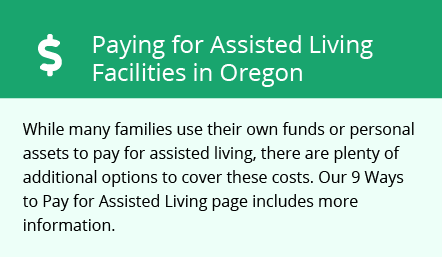 Seniors and their families who are budgeting for memory care services in Bend may find that Oregon's friendly tax policies can help them save toward their goals. For one thing, Oregon does not have a state sales tax. Even more importantly for many retirees, Social Security benefits are also tax-free in the state, allowing seniors to keep more of their incomes. Property crimes in Bend occur at a rate that is higher than the U.S. national average. The chance of a senior becoming a victim of a property crime in the city is one out of 44. However, for violent crimes, the odds are only one in 852, which is close to the average rate across the country. Memory Care costs in Bend start around $3,772 per month on average, while the nationwide average cost of memory care is $4,778 per month. It’s important to note that memory care rates in Bend and the surrounding suburbs can vary widely based on factors such as location, the level of care needed, apartment size and the types of amenities offered at each community. To see a list of free memory care resources in Bend, please visit our Assisted Living in Oregon page. Bend-area assisted living communities must adhere to the comprehensive set of state laws and regulations that all assisted living communities in Oregon are required to follow. Visit our Memory Care in Oregon page for more information about these laws.